Angelenos will have the chance to marvel at the beauty of bioluminescent plankton after a hike by the light of the moon when Night Life LA, an immersive outdoor art installation, comes to a secret location in Northeast Los Angeles. Taking place over three nights — from May 31 to June 2 — this free event is produced by the anonymous artists who created the much-ballyhooed Griffith Park Teahouse, Lost and Found LA and Petal Drop 01 and 02. The adventure begins with a moonlit hike. Small groups will then enter an ethereal environment highlighted by a magical wading pool aglow in bioluminescent blue plankton. These living lights are expected to respond to human movement, creating an otherworldly type of communication between hominids and microorganisms. 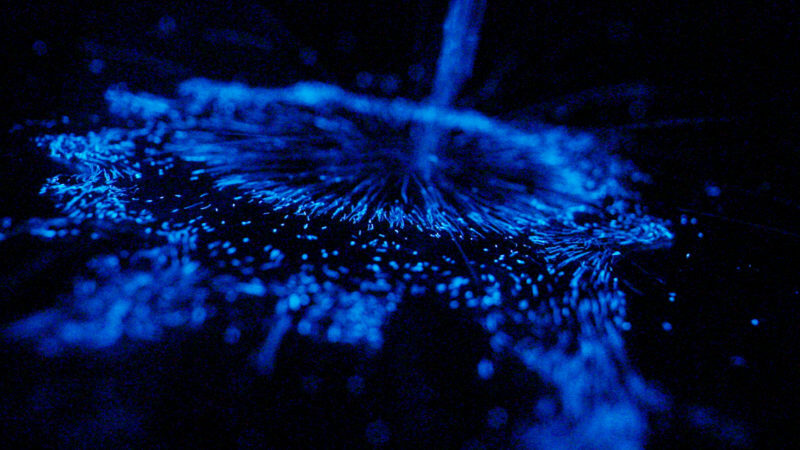 A team of marine biologists has worked with the artists for the last two years on cultivating this bioluminescence. Viewing this glowing plankton in the ocean is not a common occurrence in L.A. — though it’s sometimes present here, light pollution usually makes it difficult to see. Interested in attending? Visitors will be admitted between 8 p.m. and 2 a.m., and the exact location will be shared before the event. A limited number of free, timed-entry tickets will be available via a lottery system on May 25. You can also call (323) 905-4574 for ticketing info.